The smell of stagflation is strong this morning, because just as retail sales missed badly on both the headline and the core prints as noted separately, and as BofA predicted last night, PPI came in a hotter than expected, with both headline PPI (0.2%) and PPI ex food, energy and trade (0.4%) coming in higher than the expected prints of 0.1% and 0.2% respectively after a mixed picture from yesterday's CPI print. 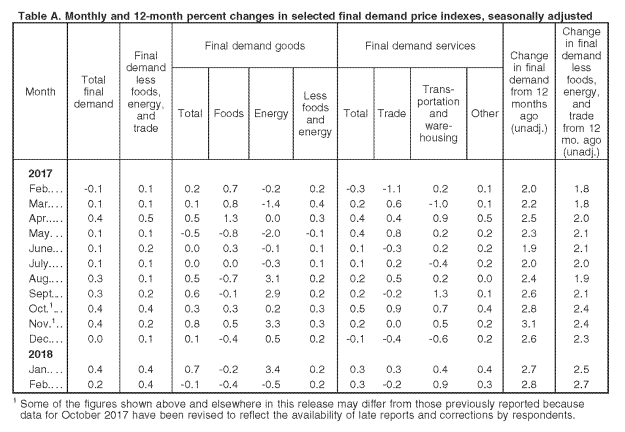 The index for final demand less foods, energy, and trade services climbed 0.4 percent in February, the same as in January. 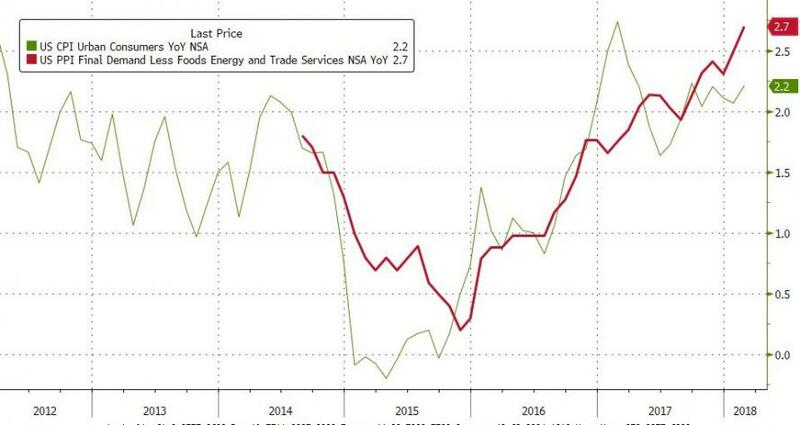 For the 12 months ended in February, core core PPI, i.e., prices for final demand less foods, energy, and trade services increased 2.7%, the largest rise since 12-month percent change data were available in August 2014. More troubling, on an unadjusted basis, the final demand index increased 2.8% for the 12 months ended in February, clearly suggesting that input costs are starting to impact business who are unable to pass on rising prices to consumers, and instead are forced to shrink their profit margins as a result. A breakdown of all key PPI components is below. Looking at final demand services, a major factor in the February rise of 0.3% in prices was the index for traveler accommodation services, which climbed 3.7%. The indexes for automotive fuels and lubricants retailing, food retailing, bundled wired telecommunications access services, hospital inpatient care, and airline passenger services also moved higher. In contrast, margins for machinery, equipment, parts, and supplies wholesaling fell 1.4 percent. The indexes for apparel, jewelry, footwear, and accessories retailing and for cable and satellite subscriber services also decreased. Separately, final demand products declined by 0.1%; leading the February decrease in the index for final demand goods, prices for fresh and dry vegetables dropped 27.1%. The indexes for gasoline, light motor trucks, diesel fuel, and liquefied petroleum gas also moved lower. Conversely, prices for primary basic organic chemicals jumped 7.2 percent. The indexes for chicken eggs, residential natural gas, and beef and veal also advanced. What happens next will be key: with input prices rising, whether companies are able to pass on these higher costs to end consumers will determine if profits margins shrink, or if inflation will truly blossom as consumer prices follow the surprising move higher in PPI, resulting in a brief burst of stagflation before the next recession.